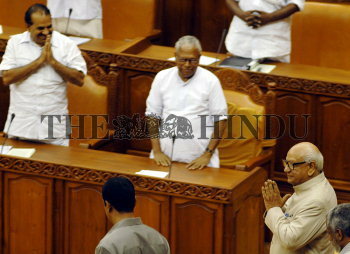 Caption : THIRUVANANTHAPURAM: The Governor R.L. Bhatia, returning after his annual address to the Kerala Assembly, in Thiruvananthapuram on March 02, 2007. Facing him first is the Chief Minister V.S. Achuthanandan. Photo: S. Gopakumar.